While Newark was founded in 1666, it was not until almost 200 years later that the area we know as Vailsburg was settled. Today and next week we are going to take a closer look at the most western extension of Newark, the last major portion of the city to be annexed in the 20th century. Originally, Vailsburg was part of colonial Newark, as was all of Essex County. After the Revolutionary War, as localities formed and gradually became municipalities, the area became part of South Orange. It became a separate borough in 1894, but it rejoined Newark on January 1, 1905 as part of the old 13th Ward. During Vailsburg's nine years of independence, it was hoped that prosperity would follow, and that property values would rise. This was not the case, and gradually a consensus formed that the borough's best interests would be served by joining with Newark and gaining civil improvements such as paved streets and sidewalks, sewers and an excellent school system. After annexation, the great empty spaces and comfortable farms were slowly replaced by attractive single and multi-family homes. Following World War I, developers and developments began to turn 'The Burg' into a sea of new homes. Colonial Heights, Underwood Park, Noll Park, Manhattan Park, Leslie Manor, Hazelwood Park, West End and Cliff Hill were all built. About the same time, former Mayor Charpes P. Gillen developed Monticello Park on the site of the old St. Mary's Orphanage and Harry J. Stevens constructed homes in Helen Place. But it was Dr. M. H. C. Vail to whom the greatest credit goes for actually putting Vailsburg in place as a borough and later as a part of the City of Newark. Truly, the George Washington of Vailsburg, he was among the first to build his home there following the Civil War at Sanford near South Orange Avenue. He was the prime mover and shaker around whom most of the early community's activities evolved. With easy access to the area, steady growth followed. Dr. Vail and a group of suburban financiers built a horse car line from Newark's Boston Street west to Munn Avenue. The Newark and Orange Horse Railroad was the result, built at a cost of $50,000. John Vose, who developed the Montrose section of South Orange was the company president, and Dr. Vail supervised the line's construction. Unfortunately, it failed financially, but it was later revived by James Boyland, and finally made a success by John Radel a decade later. By this time, Vailsburg was not only a good place to live, it had also become a major recreational site and place for national sporting events. With easy access by trolley, the Ironbound Germans and Irish flocked to the area to enjoy Schutzen or Shooting Park, later called Electric Park. In 1916, it became Vailsburg Park, and the acreage eventually acquired by the Essex County Park Commission. By the time Newark celebrated its 250th anniversary, Vailsburg was well on its way to becoming one of Newark's most important white-collar residential areas, a place filled with the homes of Newark and Essex County workers and employees of the Prudential. But it was major sporting events which really put 'The Burg' in the regional and national limelight. It was the Newark Velodrome that brought world-famous cyclists to town such as Donald McDougall, George Chapman, Alf Goulet, Percy Lawrence, and Lloyd Thomas. McDougall won the first American amateur championship in 1912, and Frank Kramer was perhaps the best-known rider in the country synonymous with Newark. 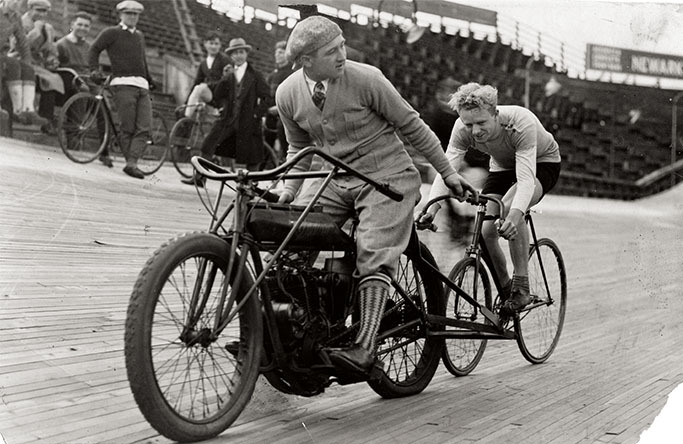 While the old one-sixth of a mile wooden banked cycling track burned some years ago, its sporting glory will live on for those who are familiar with American bike racing history. For a brief time motorcycle racing was prominent in the area, but a terrible accident at the Motordrome in September, 1912, resulting in the death of two riders and six spectators, closed the Motordrome forever. Boxing was tried in the sports halls briefly, but this did not last due in part to residential objections and an unfavorable, legal ruling from Trenton. Newark's new bedroom community had decided that it was to remain truly residential for the indefinite future.